Awards.BG presents again to the Bulgarian audience the national contests BEST DISCO & NIGHT CLUB OF THE YEAR BULGARIA and BEST DJ OF THE YEAR BULGARIA. These will be the nightlife awards which would identify the most talented Bulgarian DJs and the most famous night and disco clubs in Bulgaria. The vote is given directly in the hands of the clubbing audience from all over the country. The contest BEST DJ OF THE YEAR BULGARIA aim is to support the Bulgarian music authors, artists and DJs, nominate and award the best among them and give them the opportunity to work in the best clubs. 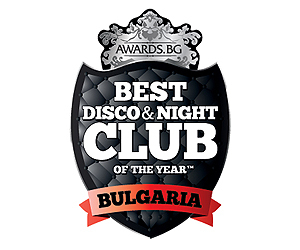 The contest BEST DISCO & NIGHT CLUB OF THE YEAR BULGARIA will promote the best Disco & Night Clubs in Bulgaria. Each of the contests consists of direct nomination and vote given by the internet users. This way an independent and objective vote can be performed eliminating the influence of a prejudiced jury which selects the winner. Additionally, an automated computer nomination and vote counting will eliminate any other human interference. The voting is restricted by Facebook profile and every user can register one vote only. Everyone can vote by sending a text message, but not more than one per SIM card. Each of the two contests is made up of two parts, followed by a ceremony where the winners in the different categories are awarded. In this stage, the internet users can suggest several Bulgarian DJs, Bulgarian night & disco clubs and nominate their favorites in the different subcategories on the awards.bg special Facebook application. The contests in 2012 will start their first stages on 27.09.2012 and will continue until 30.11.2012. In this stage the final voting and selection of winner in each of the subcategories is held. In each of the subcategories in both contests there will be five participants, who collected most nominations in stage 1. The duration of stage two is from 03.12.2012 until 10.01.2013. Gala awards ceremony to the winners in both categories in the contest will be held on 16.01.2013. At the ceremony will be present the best and most beloved Bulgarian DJs, promoters, managers and owners of the most popular and elite Bulgarian clubs, different brands and products representatives, consistently supporting the premium segment in the discotheque business. The awards for each winner will consist of: specially designed diploma and statuette, web advertising package, financial bonuses and other benefits depending on the total prize fund. In order to increase the interest among the internet users who nominate and vote in the first two stages of the contests, many additional prizes will be provided for them. All sponsors of the contests may provide complimentary prizes for the voters and most among the audience. By giving a vote, every participant accepts the terms and conditions of the contest and is involved in a lottery with his email address, where he can win a prize provided by the contest organizers, sponsors or participants. The recruitment of sponsors and media partners is an important part of the possibility the events to be organized and carried out at a high quality level. There may be several sponsors for each category, but each category can be exclusively sponsored by only one brand. Moreover, this category can be reserved for the sponsorship of a single brand and in the future editions of the contests. Platinum sponsor – VIP level and prerogatives. Gold sponsor – middle level of sponsorship with excellent parameters. Silver sponsor – starting sponsorship level. BEST DISCO & NIGHT CLUB OF THE YEAR BULGARIA & BEST DJ OF THE YEAR BULGARIA are registered trademarks.